The beignets debate is fierce in NOLA. 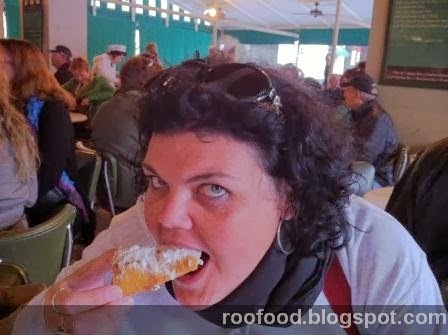 Which beignets are best? What is a Beignet? Its a French deep fried piece of dough sprinkled liberally with icing sugar. You had me at deep fried! and icing sugar! what's not to love? Beignets can also come with different toppings and flavourings and even savoury beignets are found around the city. In our quest to devour all things Cajun and Creole we hunted out two of the most famous beignet place. Cafe du Monde and Cafe Beignet. We head to Cafe du Monde in the French Quarter first, mainly because it's on the tourist trail and seems to be the most hyped up beignet place. We find the outside area is over crowded so we wait a few minutes before diving on a table. Waitress' clad in the famous green and white uniforms take your order. They are quick and efficient (you would have to with a place that is crazy busy all day!). The menu is conveniently stuck to the side of the napkin holder. Along with our beignets, I decide to order a cup of coffee with chicory. 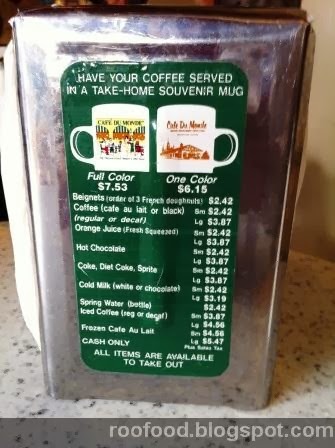 This is the creole way of drinking coffee. Served piping hot and laden with icing sugar, each serve has 3 big fritters. Enough to share between the two of us. Word of warning.... do not breath in (or out) when the fritter is near your mouth....breathing in will induce coughing and well breathing out send icing sugar everywhere. Of course saying that, if you want to be funny by all means go ahead and cover your friend in said icing sugar! digging in - you can't help but get icing sugar everywhere! Biting into the hot sticky dough (trying not to breath in the icing sugar) I'm in dough heaven. These are crispy on the outside and a little doughy in the middle. These are pretty tasty. 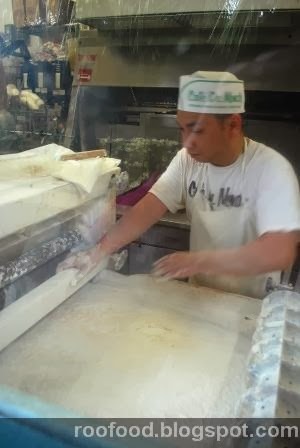 Not many people know this, but around the back of Cafe du Monde there is a window where you can peer into the kitchen and watch these fried fritters being made. 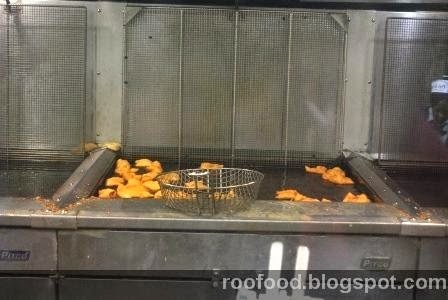 This is the machine that rolls out the dough and cuts it into squares ready to be thrown in the fryer. The following morning (before cooking school and food tour) we headed to Cafe Beignet on Bourbon Street (tucked in the back of Musical Legends Park) for a beignet breakfast. 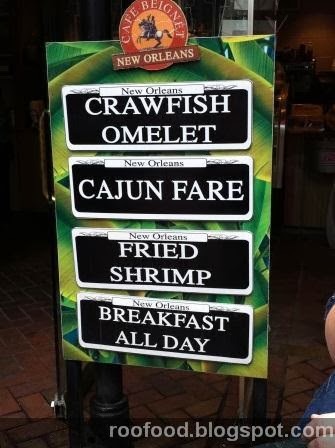 Just a few local dishes on offer at the cafe along with Beignets. 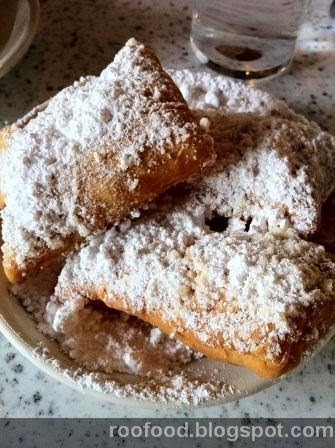 My mouth is watering, however we are here just for Beignets this morning. This place is much more relaxed, smaller and only a few tables to sit at. No fancy crockery here...it's more a take away place. We order a served (again 3 being the popular number) and these fritters are square and a good amount of dusting. Piping hot (like they have to be) and not greasy these fritters are perfect. Crispy surrounds a light and fluffy inside. These are the best ones for me! As for the chicory coffee, it's not really to my tasting....I'm more of a latte/cappuccino girl and as mentioned previously finding it hard to find a decent cuppa (for an Aussie girl). 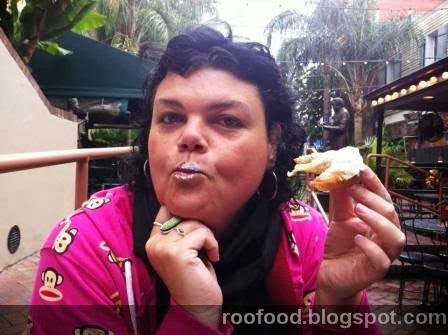 Good Morning - Pucker up for a sweet kiss! I'm officially in love with the beignets at Cafe Beignet. who wants a kiss good morning? 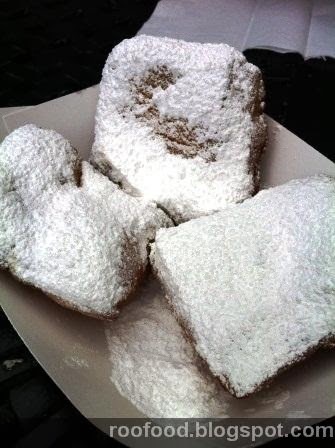 So when you're next in the Big Easy head to a local beignet place and taste for yourself. You won't be disappointed!